Coordinate with the City of Florence to develop a business plan for a Traffic Control Center that will support activities relating to timing and maintenance activities of signals and signal systems in Boone County. The business plan should identify initial and future corridors that will be operated and maintained by the Traffic Control Center. Additionally, the business plan will identify a facility, staffing, operational, and interface requirements of the proposed Traffic Control Center. The Traffic Control Center should be scalable to accommodate initial Boone County Corridors as well as future corridors throughout the three northern Kentucky Counties (Boone, Kenton and Campbell). As Boone County takes on timing and maintenance responsibilities, consider appropriate locations for installation of advance signal technologies such as adaptive signal and vehicle to infrastructure communication along the corridors. Local control of traffic signals allows an expedited response to emergency calls and changes in traffic patterns. The traffic control center will provide the needed staffing to operate and maintain adaptive signal controls in Boone County. Adaptive signal control is a technology that allows traffic signals to automatically respond and adjust to changes in traffic volumes to maximize the potential vehicular throughput on the existing roadway network within existing right of way. Local control of traffic signals will enable Boone County to install vehicle to infrastructure communication. The ability to communicate information directly to vehicles will result in real time safety and congestion solutions through crash avoidance, variable travel speed control and alternate routing. With this network in place, Boone County will be primed to seize upon opportunities from emerging technologies in the automotive industry to provide highest quality, most cost effective, safe and efficient transportation infrastructure possible. A Boone County traffic control center will require a capital investment as well as ongoing funding to support staff and operational costs. Existing funding associated with traffic signals may be transferred from the Kentucky Transportation Cabinet to the County. However, additional funding will be needed to construct and staff the future facility. Operating costs associated with the traffic control center vary widely based on the number of traffic signals that are to be maintained. 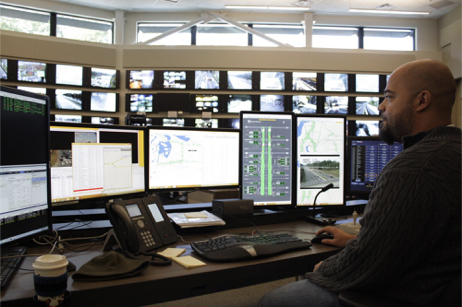 Per the U.S. Department of Transportation’s Office of the Assistant Secretary for Research and Technology the annual operation and maintenance cost of a traffic control center ranges from $50,000 to $1.8 million, and the annual cost for personnel ranges from $55,000 to $1.3 million, depending on the number of signals systems maintained. Boone County has experienced rapid growth in both population and employment. This growth has resulted in a large increase in traffic volumes and congestion on the Boone County roadway network. As the County continues to develop, traffic patterns continuously change resulting in outdated signal timing and additional delay along major corridors. The Kentucky Transportation Cabinet (KYTC) is currently responsible for operating and maintaining traffic signals along state maintained roadways in Boone County. However, the rapid growth and evolving traffic patterns has outpaced KYTC’s capacity to keep signal timing up to date. The Northern Kentucky District 6 Office is responsible for maintaining more signals than any other district in Kentucky, without additional staffing. Boone County leads the region and state in employment growth with an additional 20,000 or more new employees projected by 2040. Boone County population growth is projected to increase to almost a quarter of a million people by 2040 which is highest in the OKI region and Commonwealth of Kentucky.